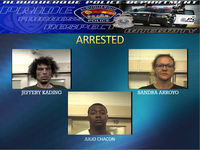 Jeffery Kading, Sandra Arroyo, and Julio Chacon were all arrested by APD Narcotics detectives. Jeffery Kading, 34, and Sandra Arroyo, 40, were both arrested on drug related charges after a APD Narcotics Detectives obtained a search warrant. The Albuquerque Police Department Valley Area Command Field Units and Valley Area Command Police And Community Together (PACT) Team received information that a male identified as Jeffery Kading was selling Methamphetamines in the Valley area. These units took this information and passed it onto the Albuquerque Police Department Narcotics Unit to further investigate this. On March 15th, the detectives conducted an operation that lead them to to the Transit Center in downtown Albuquerque. During their investigation they were able to determine Jeffery Kading was selling meth in this area. Detectives were able to secure a search warrant to seize the meth. During this investigation it also lead detectives to Sandra Arroyo and Julio Chacon who were both arrested at Robinson Park. All three suspects were taken into custody and booked on charges. Kading was charged with Trafficking a Controlled Substance, Arroyo was charged with Possession of Meth and Chacon was on probation for a past charge of Aggravated Assault on a Peace Officer with a Deadly Weapon which was now violated. 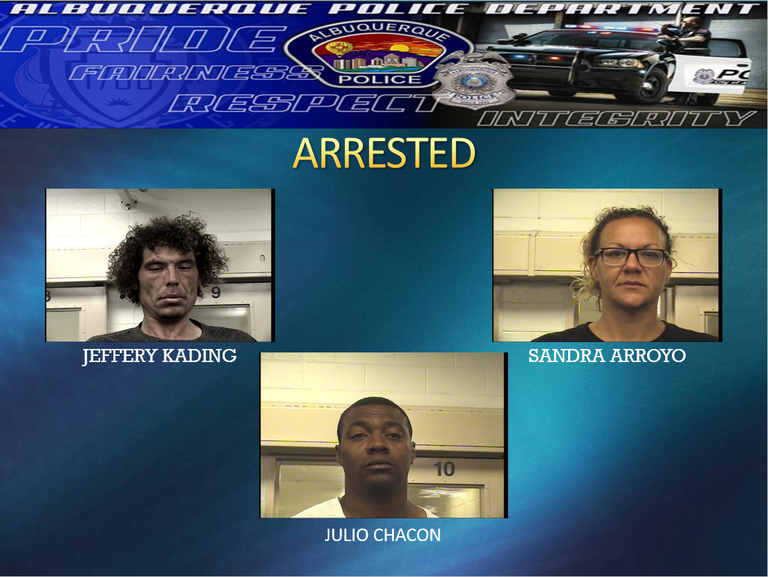 The Albuquerque Police Department Valley officers, PACT Team and Narcotics Unit did an outstanding job with sharing information and working together to get these three apprehended. Kading and Chacon remain in custody at MDC. Arroyo has since bonded out.